History: 50 year old female with right lower quadrant pain. 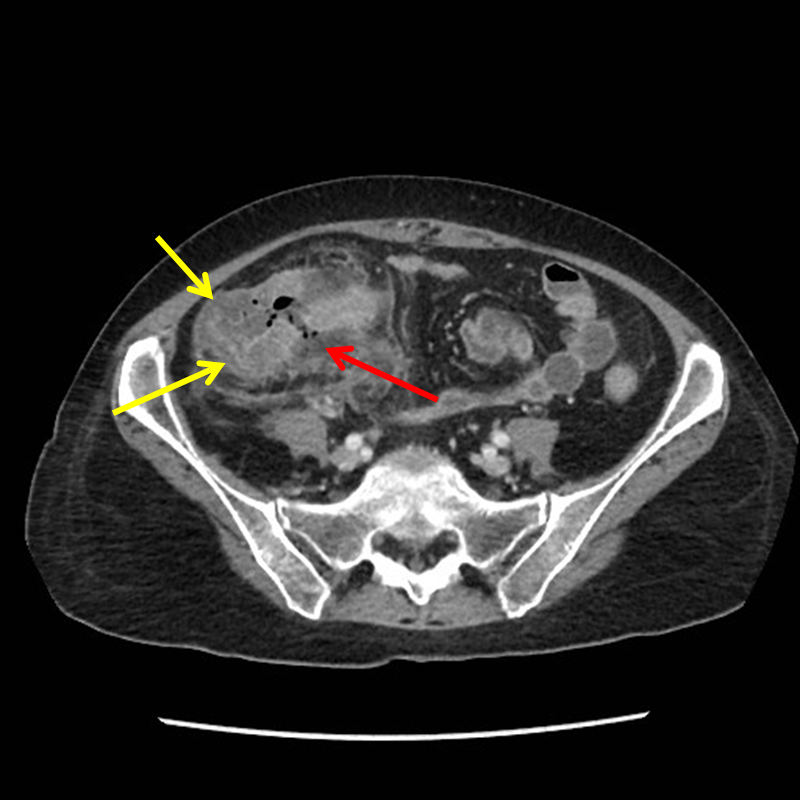 Perforated typhlitis – axial contrast enhanced CT of the abdomen and pelvis demonstrates marked cecal wall thickening (yellow arrows), a focal defect in the wall of the cecum (red arrow) with extraluminal gas and fluid. 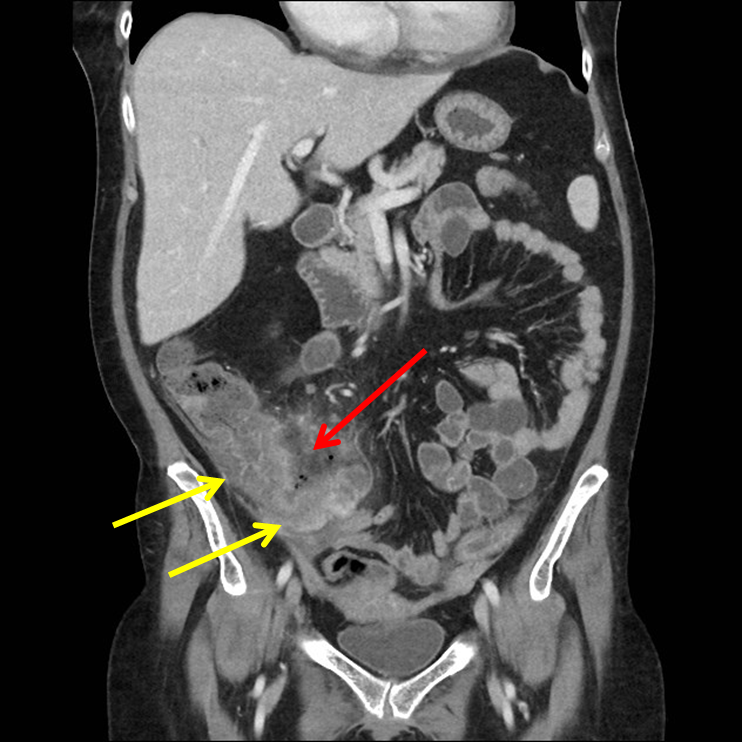 Perforated typhlitis – Coronal contrast enhanced CT of the abdomen and pelvis demonstrates marked cecal wall thickening (yellow arrows) and a focal defect in the wall of the cecum (red arrow) as well as extraluminal gas and fluid. Typhlitis is a necrotizing process of the cecum, occurring in neutropenic patients who are usually receiving combined chemotherapy. The atonic cecum is affected because of its poor arterial perfusion, the presence of colonic bacteria, and the milieu of immunosuppression. Other terms that have been used to describe this syndrome include “necrotizing enterocolitis” and “ileocecal syndrome.” Neutropenic enterocolitis occurs most commonly in individuals with hematologic malignancies who are neutropenic and have breakdown of gut mucosal integrity as a result of cytotoxic chemotherapy. Gross and histologic examinations may reveal bowel wall thickening, discrete or confluent ulcers, mucosal loss, intramural edema, hemorrhage, and necrosis. Various bacterial and/or fungal organisms are often seen infiltrating the bowel wall. Computed tomography (CT) is the preferred imaging modality for diagnosis. Both oral and intravenous (IV) contrast should be given, when feasible. However, oral contrast is sometimes not tolerated in patients with severe gastrointestinal tract symptoms, and IV contrast is typically avoided in patients with renal insufficiency. Ikard RW. Neutropenic Typhlitis in Adults. Arch Surg. 1981 Jul;116(7):943-5.